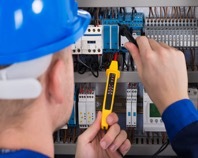 Whether you require planned preventative or corrective electrical maintenance, Hendry Electrical deliver an electrical maintenance solution that will meet all your requirements. Failing electrical systems can be dangerous, affect business productivity and be costly, at Hendry Electrical we offer a long term solution with regular site visitations where data is gathered prewarning our clients about areas of concern with a power quality assessment. This results in the protection of your equipment/appliances and maintains a healthy compliance with regulations and standards.